Lebohang Monyatsi is the first woman in Africa to be a runway model in a wheelchair. Like Jillian Mercado, another model who was diagnosed with muscular dystrophy as a child and ended up in a wheelchair when she was 12 years old, Monyatsi is challenging views on the hindrances of disability. Even for people unencumbered by any disability, the fashion world can be really difficult to break into but Lebohang Monyatsi will not let anything stop her. Organisations like The Only One Foundation are helping to make it easier for disabled people to find a space in the industry. 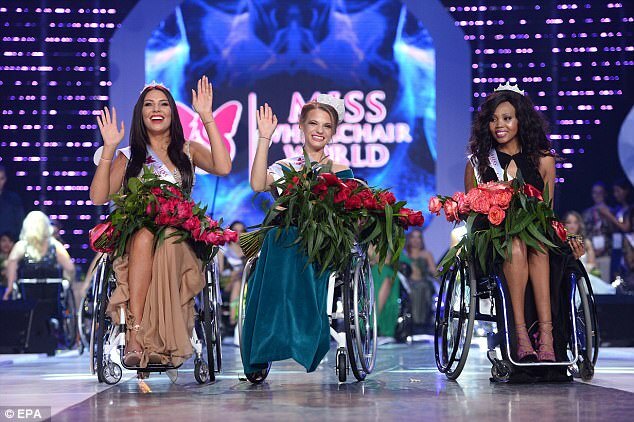 The foundation supports projects such as Miss Wheelchair World, in which Lebohang Montyatsi was chosen to represent South Africa in 2017. She told She Leads Africa that she wants people to know that disabled people have other abilities beyond sports activities and office work. She also revealed that she had always wanted to embark on the ‘journey’ from a young age but could not because of lack of opportunities for people with disabilities in the entertainment industry. Lebohang was born and raised in North West Province, in a small town called Vryburg. She was raised by her grandmother who was unemployed with a little help from government’s grants. When she was just three years old, she was diagnosed with Polio Mailaitis and as a result, was not able to start school in time like other children of her age. As if that was not enough, Lebohang lost her mother still at a very young age and also lost her best friend – her high school teacher Mrs. Setshedi- during her teen years. She spent most of her life in boarding school at Gelukspan and has since depended on a wheelchair for movement from the time she was 3. No wonder the model is extremely passionate about the needs of children, disability inclusion and accessible features for all. Apart from being a model/ beauty pageant, Lebohang is also a basketball player. While a student at the North-West University, Mafikeng, her strong abilities in the game of basketball earned her a spot in South Africa‘s wheelchair basketball team. Together, they went to Mexico where the South Africans played in a qualification tournament in Guadalajara but failed to qualify for the 2012 Paralympics games held in London. That notwithstanding, Lebohang was named best shooter of her team. Due to her talent in the sport, she now plays for both provincial and national wheelchair Basketball teams. Consequently, the young lady has been had the opportunity of travelling around South Africa and outside the country too. ”I don’t see my self not playing basketball, love it”, she says. According to Miss Lebohang Monyatsi, known on social media platforms as the Rolling Goddess, she has loved modelling since she was a child but could not pursue it because there were no opportunities for people with disabilities in the industry. She also lamented that South Africa ignores diversity and inclusion. Lebohang finally decided to chase after her dream of being a model in order to open doors for others and be a role model to all the people who thought it was not possible. She also aims at going beyond the local modelling arena to the international stage. The purpose-driven lady, however, does not think that modelling on a wheelchair will catch on anytime soon in Africa. Lebohang was a finalist for Face Of The Globe in 2016 and has modelled at Soweto Fashion week which appeared on Selimathunzi. She has also modeled at Maboneng Fashion week and GeeJunction Fashion show. The Face of the Globe is a Worldwide confidence building program and competition for young women of all ages which focuses on volunteerism and raising money for charities. Lebohang was the only finalist in the competition with a disability. Aside from being Africa’s first wheelchair runway model she also represented her country in the 2017 Miss Wheelchair World. In the contest which was the first of its kind, held in Warsaw, Poland, on 07 October 2017, Lebohang emerged the runner-up (second) ahead of Poland’s Adrianna Zawadzinska and was crowned as ‘First Princess’. This was a huge success for the South African record breaker considering the fact that the competition featured 24 young women from 19 countries. According to the model, her daily motivation comes from the quote, “be the change you wish to see”. This spurs her continuously to lead by example.